مقالة حاضر برگرفته از پژوهشی است که ارتباط بین پایگاه اجتماعی‌ـ اقتصادی و تماشای خشونت‌ تلویزیونی را با رفتار خشونت‌آمیز کودکان بررسی می‌کند و تأثیر رفتار خشونت‌آمیز والدین را بر توسل کودکان به خشونت مورد مطالعه قرار می‌دهد.نتایج به‌دست آمده نشان می‌دهد کودکانی که برنامه‌های خشونت‌آمیز تلویزیونی را بیشتر تماشا می‌کنند و کودکانی که در معرض رفتار خشونت‌آمیز والدین قرار می‌گیرند، بیشتر از دیگر کودکان به خشونت متوسل می‌شوند و به تماشای خشونت تلویزیونی تمایل بیشتری دارند. effects of parents' violent behavior on children resorting to violence. likely to resort to violence and tend to watch TV violence. توسلی، غلامعباس. (1379). عوامل اجتماعی تعلیم و تربیت. 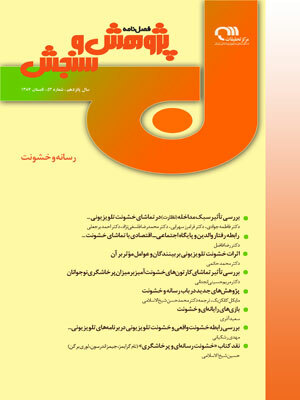 فصلنامه تعلیم و تربیت نشریه پژوهشکده تعلیم و تربیت وزارت آموزش و پرورش، سال شانزدهم (3). Bandura, A. (1974). Behavior Theory and the Modes of Man. American psychologists, 29, pp 589-869. Bandura, A. (1969). Social Learning Theory of Identification Processes. In D.A. Goslin (Ed). Handbook of Socialization Theory and Rand McNany. Breheme, Sharon & Kassin M.Saul. (1998). Social psychology, Houghton Miffim company . PP. 367. Buss, AK. (1975). The Emerging Field of Sociology of Psychological Knowledge. American Psychologist, 30, pp. 988-1002. Fredrich L.K, & Stein A.H. (1973). Aggressive and prosaic television programs and natural behavior of preschool children. Monographs of the Society for Research in child Development 38, (No 4, whole No 151). Freedman, J.L. (1984). Effects of Television Violence on Aggressiveness Psychological Bulletin, 96, 227-246. Gerbner, G., Gross, L., Morgan. M. and Signorelli, N. (1994). Growing up withTelevision: The Cultivation Perspective. In: Bryant, J., and zillmann, D. (Ed) . Media effects: Advances in theory And research, Hillsdale, NJ: Erlbaum. Grusec, J.E. (1972). Demand Characteristics of Modeling Experiment, Altruism as a function of Age and Aggression. Journal of personality and Social psychology, 22.pp.139-148. Gunter, B & Harrison, J. (1998) Violence on television: An analysis of amount, nature, location and origin of violence in British programs. Routledge. Hodge. Bob. & Tripp, David, (1986). Children and television. Polity press. Horton, Robert & Santagrossi, David. (1978). The Effect of Adult Commentary on Reducing the Influence of Televised Violence. Personality and Psychology bulletin, VoL 4 (2). Lazarsfeld, P.F. (1955). Why is so little know about the effects of television and what can be done? Public Opinion. Quarterly. 19. 243-251. Lytlon, H. (1980). Parent child interaction: The Socialization observed In twin and singletor, families. New York: Plenum Press. Parke, R.D. & slaby, R.G. (1983). The Development of Aggression. In: E.M.
Potter, W.j., Warren, R. (1996). Considering Policies to Protect Children from T.V. Violence, Journal of Communication, 46 (4), 116 -138.
use and Grasp of the Medium, Human Communication research, 11 (4). Velicer, W.F., Govia, J. M., cherico, N.P., & Corriveau D.P. (1985). A Measurementmodel for measuring attitudes toward violence, Personality and Social Psychology Bulletin, Vol. 15, No 3, 349 -364. Walters, J.D Pearce. D. and Dahms, L. (1957). affection and aggressive behavior of preschool children. Child Development, 28,15-26. Wislon, B.j , Kunkel D., Potter, D, Doner, N., Smith, S.L: (1996). Broadcasting of violence in American tv. A Qua-ntitative Panaroma.